Opportunities to learn in a woodland setting do much to promote children’s learning and spiritual, moral, social and cultural development. 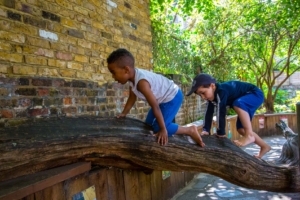 Forest School is an approach to outdoor learning; it has its origins in Scandinavia. It provides children with a valuable opportunity to learn about the natural environment through play. During these positive outdoor experiences children learn how to handle risk and to use their own problem solving skills. They build their self-esteem and grow in confidence. The children develop their physical and social skills whilst cooperating with others. At Chelsea Open Air we have fully trained advanced Forest School Leaders who embed these practices in our day to day school life. Children access Forest school through our unique garden setting and expeditions into the local community.